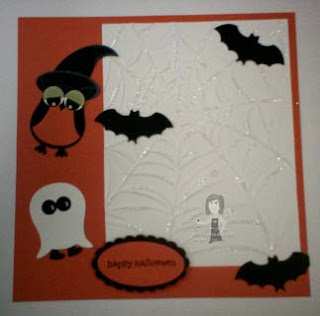 Rubber Room Ramblings: 6x6 HALLOWEEN SCRAPBOOK PAGE! My First Friday of the Month Club always does a 6x6 Scrapbook Page, and here is the page we made for Halloween. As you can see, it is full of awesome Stampin' Up! Punches and, of course, the Web Embossing Folder for your Big Shot. 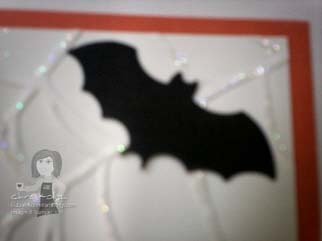 Here's a little close up photo so you can see the glitter on the web. To add my glitter, I just used my Stampin' Up! Tombow Two-Way Glue Pen and randomly added glue to the embossed web. Then I sprinkled Dazzling Diamonds glitter of the card front, and it sticks only to where the glue is. GLASS COASTERS FOR THE HOLIDAYS! CURLY LABEL PUNCH MEETS THE SNOW! IT'S SALE TIME AT STAMPIN' UP! TOTALLY TOOLS FOR HOLIDAY GIFT CARD GIVING! VIDEO TUTORIAL FOR TEALIGHT BOXES! RUBBER ROOM VIRTUAL CLASSROOM IS UP AND RUNNING! TRULY WONDERFUL WAY TO START THE WEEK! FROWL SANTA 6x6 SCRAPBOOK PAGE! DAY OF GRATITUDE 6x6 SCRAPBOOK PAGE! WATCH IT WEDNESDAY TEALIGHT TUTORIAL! WHAT A SILLY GIRL I AM!! LARGE TEALIGHT FOR THE HOLIDAYS! A LITTLE PEEK INTO MY WORLD! MY DECK THE HALLS CANDY HOLDER! THE RUBBER ROOM VIRTUAL CLASSROOM IS HERE! WATCH IT WEDNESDAY IS BACK!